In our region of Burgundy, and the two neighbouring regions of Champagne and the Loire Valley, the spectacular pageant of autumnal colours peaks mid- to late-October. 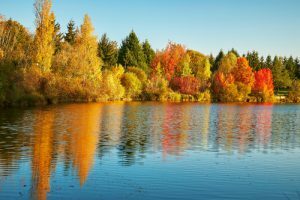 However, you will see a good palette of colours, from rich golds to deep reds, anytime from early October to late November, making it a really special time to visit France in a campervan. 1. Walk in the vineyards: the golden colours and autumn light make for surreal scenery and fantastic photography. 2. Ride a bike along the tree-lined cycle routes of France. Many canal tow paths have been surfaced to encourage cyclists – they are peaceful and stunning in the autumn. 3. Drive through the Loire Valley, Burgundy and Champagne. The combination of quiet roads, fine wines, rich autumnal colours and chateaux are totally irresistible. 4. Head to an outdoor market to buy mushrooms, truffles, apples, pears, nuts and all kinds of interesting squash. 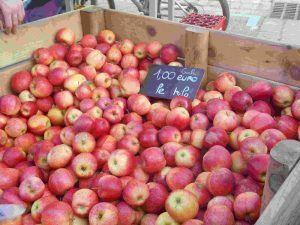 What a deal: 1 euro for a kilo of sweet autumn apples! 5. Dine out in a restaurant: autumn ingredients in France are a chef’s delight and inspire creativity like no other season. 6. Take a hot air balloon trip: you won’t see sights like it at any other time of the year. 7. Visit a really famous tourist attraction that would usually be too busy to enjoy, from the magical monastery at Mont-Saint-Michel to the vast Medieval citadel of Carcassonne. 8. Coincide with an autumn event. There are a huge number of events from jazz festivals to wine and food festivals at this time of year. For a full list of events in any region of France, just visit the regional tourist board that you are interested in. 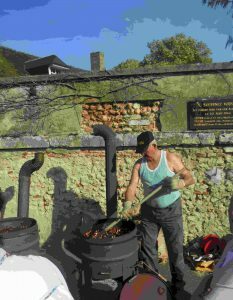 Delicious châtaignes grillées – roasted chestnuts. Why not book a last minute trip to France and come and see the autumn colours? Our lowest prices of the year start 17th October, and everything else you might book for an autumn trip is inexpensive at that time of year too, from flights and ferries to a night in Paris.